Frederick Banting’s scientific discovery and research are widely known and celebrated, but other aspects of his life remain less known. One part of his life that is often overlooked is his military service. Banting served in both the First and Second World Wars, where he put his scientific and medical knowledge to use as a surgeon and researcher. Banting attempted to enlist in the First World War when war was declared in 1914. He was rejected because of his poor eyesight, but he was eventually able to join the Canadian Army Medical Service in 1915. Doctors were greatly needed during the war, and Banting’s medical class had their classes condensed so they graduated in 1916 instead of 1917, allowing them to fully join the war effort. 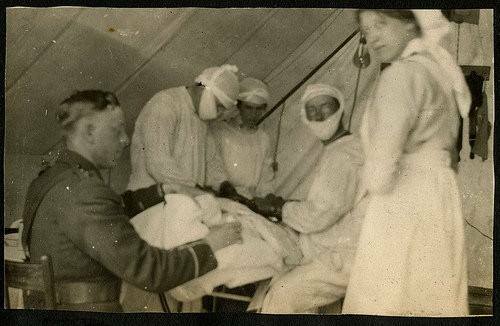 In 1917, Banting went to England and was later sent to France in 1918 to work in rear hospitals and front line aid stations. Banting was eventually wounded during his service, and was hit by a piece of shrapnel in his right forearm. Despite this, Banting continued on to provide aid to the other soldiers. Banting and his fellow medical practitioners during the First World War. Banting received the Military Cross for his “energy and pluck” in the midst of the war, and wrote to his mother saying he was “the luckiest boy in France!” since he returned to England after one battle. The end of the war meant a huge upheaval upon Banting’s return home. Because surgeons were in high demand in the years following the war, he took a chance to work in London, sending him on the path to discover insulin. When the Second World War broke out, Banting planned on returning overseas, but he was seen as being necessary to military research. Banting carried out research on biological and chemical warfare, a controversial stance for him to take. He was tasked with finding solutions to end the war. To Banting’s credit, he believed in putting himself on the line and tested the effects of mustard gas on his own leg. He worked on other scientific projects during this time, including the development of an anti-gravity suit (named Frank’s Flying Suit) designed so fighter pilots would not pass out due to pressure changes. Banting’s research was seen as being incredibly important to the war effort, and on February 20, 1941, he left for England to transfer research to Canada for safekeeping. Unfortunately, there was an engine failure in his plane, causing it to crash at Seven Mile Pond. Banting died the day after the impact at the age of 49, and was awarded the Memorial Cross after his death. Both the Memorial Cross and the Military Cross are on display at Banting House NHSC, along with other medals awarded to him during his time the military, bringing light to the role he played in both World Wars.